NBC lost some stamina last night. NBC: AMERICAN NINJA WARRIOR took an odd half-point hit to 1.4, and RUNNING WILD fell 0.3 to 1.0. Both shows are listed as originals (UPDATE: BUT THE AMERICAN NINJA WARRIOR EPISODE WAS A CLIP SHOW), and although the network was preempted in Cincinnati for the local NFL simulcast, that normally increases preliminary numbers instead of bringing them down, so it’s not clear, which explains why the night went so badly. 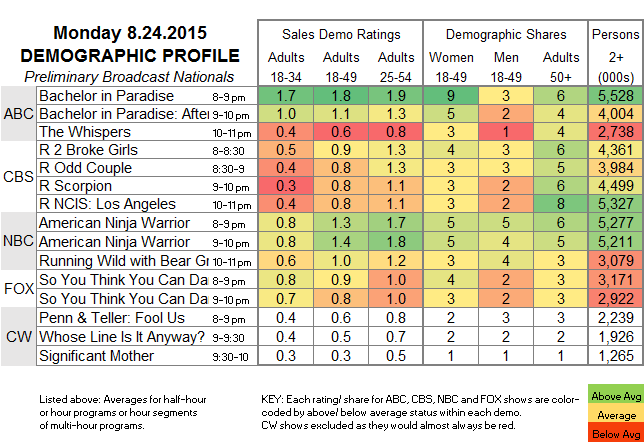 ABC: BACHELOR IN PARADISE gained 0.3 to 1.8, and the after-show was up 0.4 to 1.1. However, none of that did much for THE WHISPERS, which rose 0.1 to 0.6. FOX: SO YOU THINK YOU CAN DANCE was steady at 0.9. CW: PENN & TELLER: FOOL US is currently up 0.1 to 0.6, WHOSE LINE IS IT ANYWAY is stable at 0.5, and SIGNIFICANT MOTHER is up 0.1 to 0.3. However, the NY CW station was preempted for baseball, so those numbers may change. 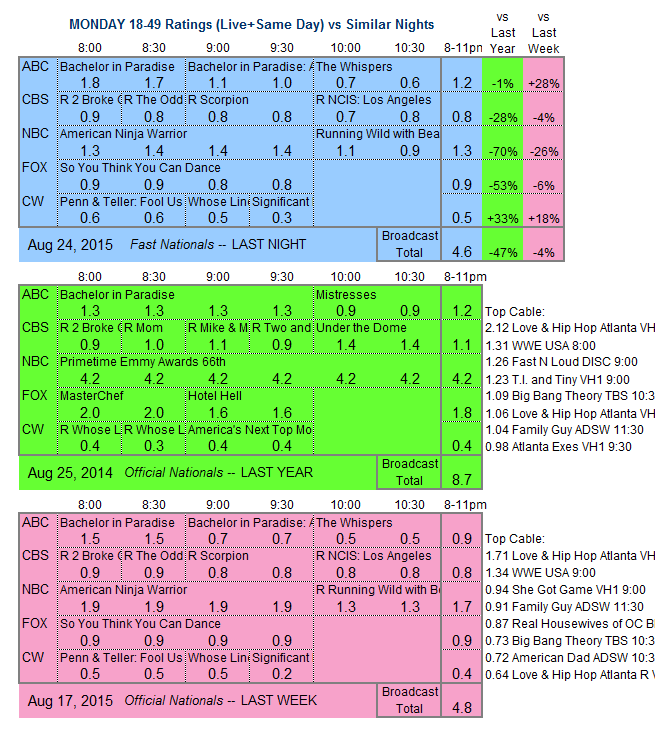 CBS: Reruns led by 2 BROKE GIRLS and THE ODD COUPLE at 0.9. While other cable networks are folding their summer tents, TNT premieres its period cop show PUBLIC MORALS tonight.